Express Glass & Board Up, a professional sliding glass repair service in West Palm Beach, has announced the success of its hurricane preparedness tip sheet in Florida. The "tip sheet" was accessed hundreds of times pre- and post-hurricanes. Express Glass and Board Up, a top-rated sliding glass repair service in West Palm Beach, Florida, is proud to announce the achievements of its innovative "hurricane tip sheet" post-Irma. The "tip sheet" has been accessed hundreds of times by area residents both before and after recent storms. http://www.expressglassfl.com/blog/glass-repair/hurricane-relief/. Some of the tips are as follows. West Palm Beach residents may consider prioritizing sliding glass repair prior to a tropical storm, high impact window glass may help Florida residents living in locations around the coastline, and a hurricane preparedness plan including 24/7 emergency glass repair and board up information could help support a quicker recovery. Persons seeking West Palm Beach glass repair options should visit http://www.expressglassfl.com/west-palm-beach-glass-window-repair/. Here is background to this release. West Palm Beach has been described as being located in “hurricane alley.” Tropical storms hitting the Florida coast may strike the city first. Hurricane preparedness for future storms and setting priorities may be the best defense against dangerous high winds. As West Palm Beach continues to recover from Hurricane Irma, new threats have been seen brewing in the Atlantic Ocean. Floridians living inland may not be concerned about every storm the weather reports share, but it can be different for coastline residents. High winds mean any storm can throw flying debris and break windows at oceanside homes and businesses. Thin or aged glass could make it easier for a smaller tropical storm to cause trouble. As post-Irma recovery efforts continue, homeowners may consider prioritizing needs for patio doors and windows. If West Palm Beach residents have sliding glass repair to do, the task may benefit from a thorough review of hurricane-proofing options. For these reasons, Express Glass & Board Up has announced the successful execution of its innovative "hurricane tip sheet." Several steps have been outlined in the hurricane tip sheet to help locals clean up post-Irma and prepare for future storms. Cities in the “Hurricane Alley” zone can be more susceptible to storm damage from the months of August to October. Residents may recover from a storm quicker if West Palm Beach sliding glass repair needs are prioritized. Choosing high-impact glass, or so-called “hurricane glass” for a home or business could help lessen a threat. Maintaining a list of emergency sliding glass repair and board up tips can also help rapid response efforts. Express Glass and Board Up Service Inc. is a family owned and operated glass repair business with more than 20 years of experience. Their professional technicians and the large variety of inventory make Express Glass the top glass repair service. If customers are looking for West Palm Beach sliding glass repair or Ft. Lauderdale glass repair as well as glass repair in Delray Beach or West Palm Beach sliding glass repair, please reach out to the company for a free estimate. If customers need a 24/7 Sliding Glass Door repair service in Ft. Lauderdale or Boca Raton or Miramar, technicians are standing by. 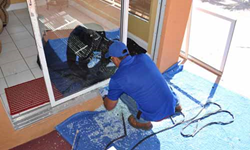 The company specializes in sliding glass door repair and window glass repair; technicians will handle any glass replacement situation efficiently. Home or business glass repair is the company's main priority.